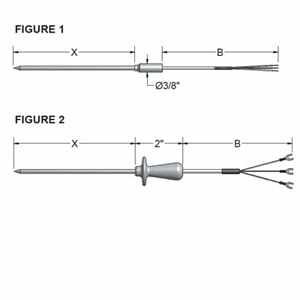 Pyromation insertion probes with formed pistol grip handles, are used to measure internal temperature of meat, fish, poultry, and other food products, both fresh and slightly frozen varieties. Other uses include penetration of soft process materials such as rubber and plastic compounds. The materials of construction are all FDA compliant for use in sanitary applications. The sheath tips are made of full hard-drawn 304SS hypodermic tubing with a sharp needle-point insertion tip. Handles are constructed of formed stainless steel tubing and are available in three size and strength configurations to match the process duty requirements. All leads are epoxy sealed. Fixed-Sheath RTD Assemblies with General-Purpose Connection Heads are provided with head mounting fittings that are welded or brazed to the sheath for direct immersion into a process. 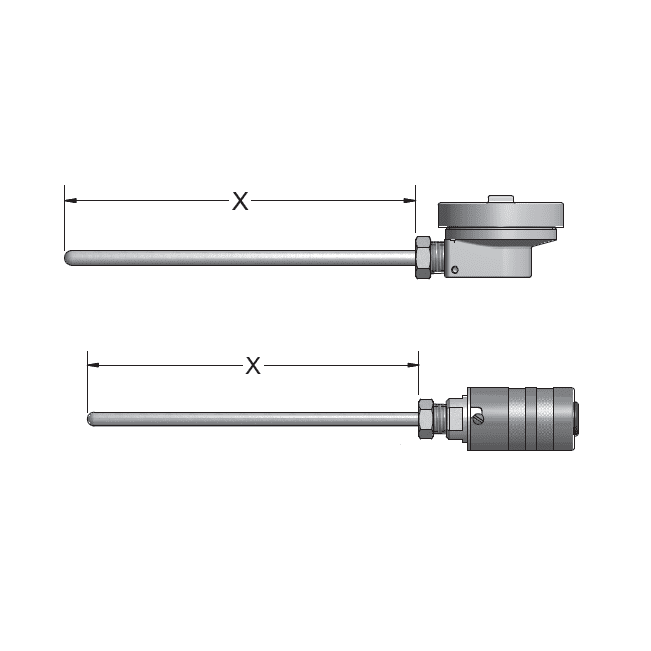 Spring-Loaded RTD/Thermowell Assemblies with General-Purpose Connection Heads are designed for use with various thermowell types. Thermocouple and RTD spring-Loaded Replacement elements are designed for spring-loaded thermowell assemblies. 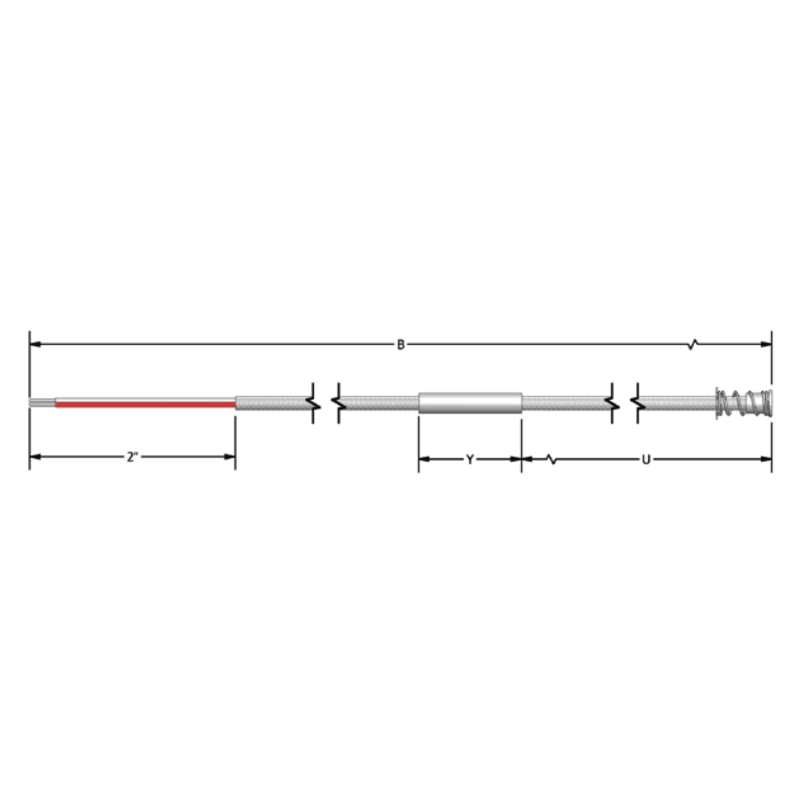 Fixed-sheath RTD assemblies with miniature heads are offered with mounting fittings that are welded or brazed to the sheath for direct immersion into a process. The miniature heads offer a compact design and are ideal for laboratory applications or applications where space is limited. 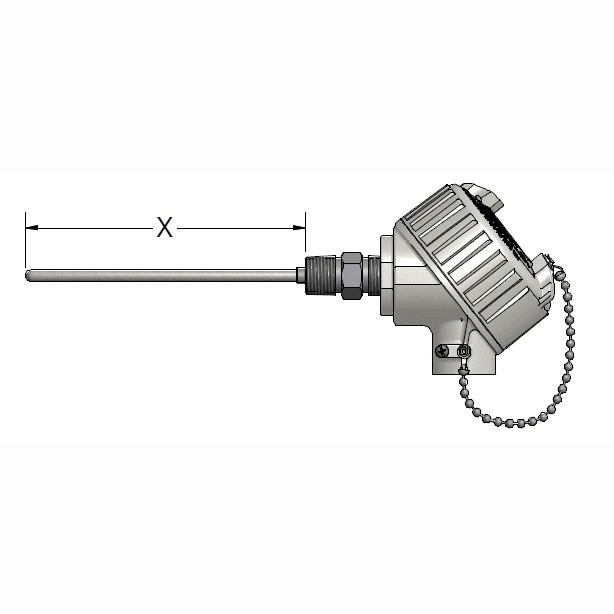 The RTD assemblies are supplied with a 316 stainless steel sheath in several diameters. They are offered in various tolerances and temperature ranges as noted below. Explosion-Proof, Fixed-Element RTDs are made for use in U.S. and Canadian hazardous areas. They are designed to extinguish flames inside the device, eliminating the potential for ignition of flammable mixtures in the surrounding atmosphere. FM and CSA approved assemblies, dependent on connection head type, meet XP Class I, Division 1, Group A, B, C and D; DIP Class II, Division I, Groups E, F, G, and Class III, Division 1. They may be installed directly in the process without being inserted into a thermowell. The assemblies feature 316 stainless steel sheaths in various diameter sizes. They are available with or without process mountings and with aluminum or stainless steel explosion-proof connection heads.